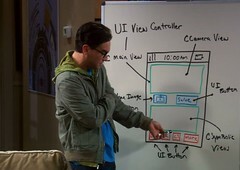 Quick Take: The Big Bang Theory, "The Bus Pants Utilization"
Review: The Big Bang Theory, "The Bus Pants Utilization"
(S0412) Sheldon ticks off the others when he wants to take over their plans to build an app to help with their complex math-making, and ends up getting kicked out of the project. Penny tries to mend the rift herself, which winds up with Sheldon getting kicked out again and working on a shoe-identification app with Penny, which will probably actually make them more money. You know, this was kind of a dull episode. Not as fun or as complex as usual, and mostly a collection of scenes of the boys sitting down and complaining. The high point involved Sheldon and the theremin, because, really, what could be better than anyone on TV playing a theremin? And he plays the Start Trek original series theme, which is always a plus. But the rest of the episode was kind of uneventful and unmemorable, which is sad because it was going so well before this. It's pretty great that Leonard finally got sick of Sheldon being a jerk, but I can't help thinking it could have been handled better, snappier, and with less griping. There was a disconnect this episode, like the producers or schedulers or someone knew that this would be a time when people might still be unable to watch regularly and just dropped in this sub-par ep so that there's a new one, but it's not that big a deal if no one sees it. I think broadcast network shows often fall victim to having episodes that look, feel, and very much are "filler." It's so ironic in that broadcast network shows get so many viewers even on a "random" night and with a filler episode. But things are changing to be sure, and that's why we're seeing ratings boom over on basic cable, where shorter season runs for scripted shows (The Walking Dead) and relatively low budget reality (Jersey Show) fare are producing booming numbers these days. The info sheets that come with the TBBT boxed DVD sets list writing credits. A large stable of screenwriters create TBBT episodes. There is some overlap, and some writers seem to come and go. The show's original creators are not always named. This particular episode's teleplay was by Bill Prady, Steven Molaro and Eric Kaplan, for a story by Chuck Lorre, Lee Aronsohn and Maria Ferrari. With Prady and Lorre involved, it's surprising it would be weak; furthermore, the others all contributed to plenty of previous episodes. How mysterious!